The significance of Private Forests in the U.S. investigates the history of private forests and the values these lands have to the United States . Students will also examine family forests in America, and take a closer look at the challenges facing private forestland owners. 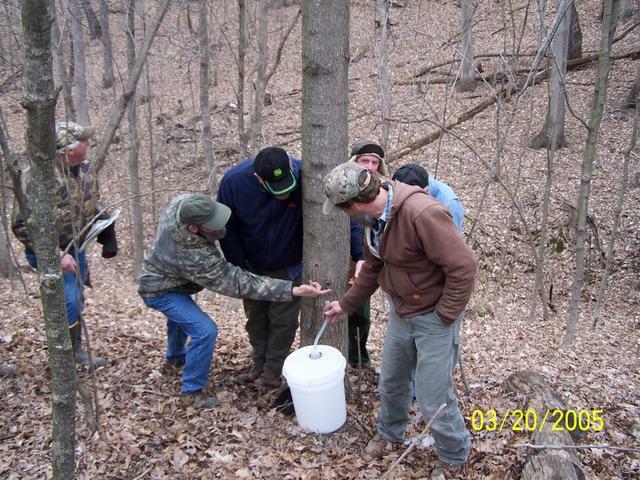 Image Caption: Private Forestland Tour: Maple Syrup Days, March 20, 2005, located on Jack Wohlstadter's Tree Farm in Illinois. The students study the economic boom and social transformation of postwar United States. Students use data and apply skills in analyzing human behavior in relation to its physical and cultural environment. Download and Print: Module 10 Teacher & Student PDFs using Adobe Acrobat. For Day 1 activity: Make an overhead copy of the Ecosystem Service chart. Make copies of the Essay for each student in your classroom. Next make copies of Worksheet 1 and Worksheet 2 for each student. Day 2 activity: Make copies of Worksheet 3 for each student in the class. Read the Worksheet 3 Teacher Instructions and prepare for class discussion. You may want to set aside computer class time for this worksheet...bar graphs using Excel. What do you know about private forest land? What are the uses of private forests? Why do people own private forests? Are most forested lands in the U.S. owned by the government or by individuals and companies? How about in your state? What products do we use that come from private forests? Discuss Ecosystem Services (using chart). What services do forests provide? Can the students think of other ecosystems and what they might provide? Now read the essay, “Understanding Private Forests & Family-Owned Forests” together as a class (silently at desk or out loud). Then complete Worksheet 1, “Family Owned Forest Facts.” Assign Worksheet 2. Discuss: Worksheet 3, "Teacher Instructions." Lead class discussion. Assign: Worksheet 3 "Reasons for Owning Family Owned Forests"
Read: "Family Forest Story - 'Tree Farming' in the U.S."
Assign: Worksheet 4 "Interview a Tree Farmer or Private Forestland Owner"
Arrange a field trip to visit a local private forest or tree farm and meet with a local forestland owner to view their land, participate in hands-on activities, or view current forest research, etc. Invite a State and Private Forester into your classroom to discuss their job in relationship to private forestland owners, the help they offer local forestland owners, and the types of management plans they might suggest to local forestland owners. Have students submit their interview article (“Interview a Tree Farmer or Private Forestland Owner”) to a local Tree Farm System or one of the Private Forest Associations in the “Links” section below to see if they can be published in the next newsletter. Technology: Students could conduct Internet research in their technology class. Students could also create a graph (using Excel) using the information in the charts from Worksheet 1 or Worksheet 3. English: Students could write a biography of a private forest land owner or the land owner’s family. Math: Complete Worksheet 1 or Worksheet 3 in Math class. Science: Have students learn more about watersheds in their community and research the ecological benefits of private forests in their area. Or have students conduct a watershed activity, “Down by the River” provided by the Missouri Department of Natural Resources. Forest Learn. Oregon State University (June 2014). Forest History Society Bibliographic resources on private forests and environmental history. Ordering Resource for: American Forests: A History of Resiliency and Recovery, The Greatest Good Film. Photo resources, Photo Galleries, by Subject: Tree Farms. American Forests has developed a program that promotes studies of urban forests and their value for the communities in which they are found. They provide an excellent extension resource to help students understand the actual value of trees to our ecosystems. Association of Consulting Foresters of America, Inc. Provides standards for the consulting foresters and educates & assists landowners in good forest stewardship. The ACF is organized into state or multi-state chapters located in most forested regions of the U.S. and may be a helpful resource for finding a private landowner to interview. Florida Ecosystem Service Valuation Project offers a good definition of ecosystem services. Forest Landowners Association collects information on private forest land in the U.S. The National Christmas Tree Association has a science curriculum online, as well as a feature where you can put in your zip code and find a nearby Christmas tree farm. Science NetLinks’, “Ecosystem Services – Water Purification” uses the example of natural water purification to show students the services provided by healthy ecosystems. Society of American Foresters is the national scientific & educational organization representing the forestry profession in the United States. SAF can provide a list of State Chapters; who could possibly provide a list of private forestland owners for interviews. Southern Research Station Compass, quarterly science magazine contains an informational article “Private Landowners Hold the Key.” This is an article about private landowner participation in the Conservation Reserve Program (CRP). State and Private Forestry, USDA Forest Service – State and Private Forestry programs bring forest management assistance & expertise to landowners. They may also provide teachers with a list of private forest owners that might help with the interview activity.